GREEN BAY, WI – Strawberry Fields Design was awarded two Silver ADDY® Awards at the 2009 American Advertising Federation – Fox River ADDY® Gala, for the websites they designed and developed for Central Church and Green Bay Christmas. 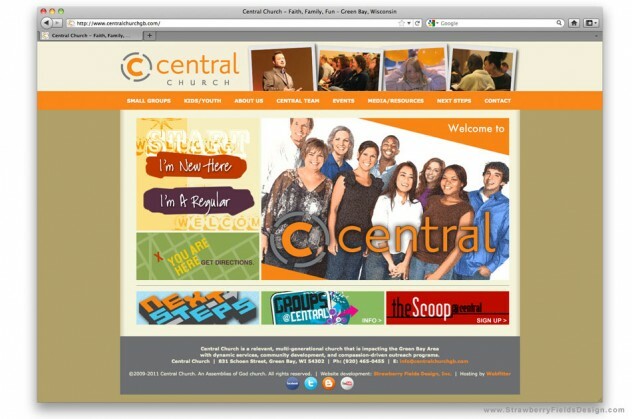 The firm was also nominated for Best of Show Interactive for the Central Church website. Central Church Website: To reach its diverse, multi-generational demographic, Central Church needed a modern website that made it easy for members and visitors to stay informed. Strawberry Fields Design delivered a website that now allows website visitors to listen to sermons online, stay current on events, and helps the church fulfill its mission to reach the greater Green Bay area with the help of search engine optimization. Central Church’s new website was part of its rebranding effort, revising its name from Central Assembly of God to Central Church, and redesigning its logo. 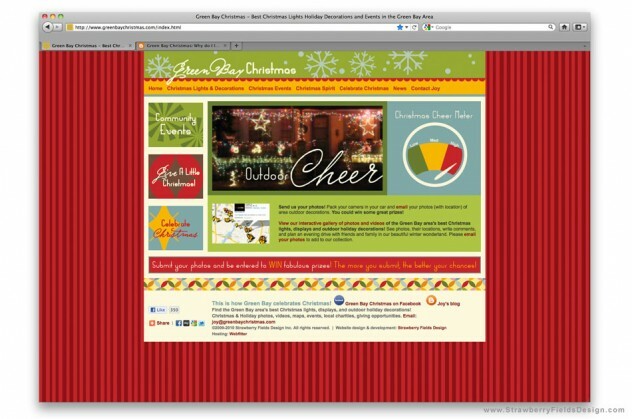 Green Bay Christmas Website: Inspired by the firm’s love for Christmas, Strawberry Fields Design created The Green Bay Christmas website connect greater Green Bay in celebrating the joy of the holiday. The site included interactive maps of outdoor holiday displays, Christmas videos, and encouraged visitors to submit photos and videos of displays. A list of local charities was also included to spur the spirit of giving. Strawberry Fields Design has won numerous ADDY® Awards for both graphic design and interactive/web design projects, including Best of Show Interactive and a Silver ADDY® Award at the district level for the website they designed and developed for Cowgirl Rose. The American Advertising Federation’s (AAF) ADDY® Awards honor excellence in advertising and cultivate the highest creative standards in the industry. With 55,000 entries and three separate judgings, the ADDY Awards are the world’s largest advertising competition and arguably the toughest. Each fall the competition begins at the local level with the over 200 AAF member clubs nationwide. The local winners advance to 14 district competitions, and those winners advance to the national finals. Less than one percent of entries receive a national ADDY® Award. About Strawberry Fields Design Inc. Strawberry Fields Design Inc. is a boutique marketing communications firm. They take a strategic approach to providing unique graphic and web design services—specializing in captivating and capturing the female audience. The firm designs and develops a broad array of print and digital marketing collateral, including websites, logos, corporate identity, brochures, annual reports, magazines, advertising materials, and social media. Located in Green Bay, WI, Strawberry Fields Design was founded in 2006 by award-winning graphic and web designer, Addie Sorbo. To view their portfolio and learn more about the firm’s services visit: www.strawberryfieldsdesign.com. Strawberry Fields Design, Inc. Celebrates its 64th (Month) Anniversary!